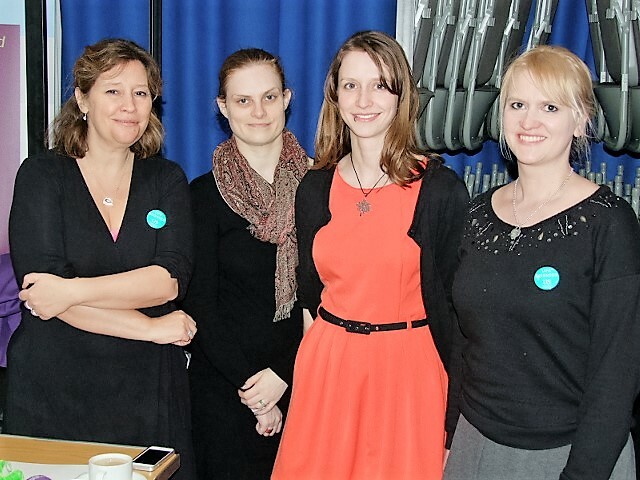 (from left to right) Professor Louise Serpell (Joint AS DTC lead, Life Sciences), Rachel Clarke (PhD student: Psychology, Social Policy), Rebecca Atkinson (PhD student: Alzheimer’s Society Doctoral Training Centre), Dr Karen Marshall (Research Fellow, Life Sciences). We recently attended the launch event of the Brighton chapter of the Dementia Action Alliance. The Dementia Action Alliance brings together people working on or with dementia, people living with dementia, and those that care for people living with dementia. Their actions facilitate information sharing, and aim to improve the lives of people affected by dementia. The event featured many interesting talks, helping to raise awareness of local work to improve the quality of life for people living with dementia, and allowed us to discuss some of the research activities ongoing at the University of Sussex with a network of interested individuals. It was great to mingle with many different people working on or with dementia; researchers, charities, businesses offering support services, and of course individuals directly affected by dementia, their families, and carers. Among the many interesting talks, there was a Dementia Friends training and awareness session. Dementia Friends is a wonderful program run by the Alzheimer’s Society, aiming to change people’s perceptions of dementia. We were so impressed by the training that Professor Serpell arranged for a Dementia Friends session to be held at the University of Sussex, for staff and students. To work in partnership together with businesses, the local authority, the voluntary sector and most importantly with people living with dementia so Brighton and Hove achieves recognition as a Dementia Friendly Community. The DAA coordinator will support and encourage organisations to submit action plans to demonstrate how they will become more dementia friendly. Through specific local named providers (The Trust for Developing Communities; Engage and Create; local Dementia Champions), to ensure that Dementia Awareness is raised significantly within Brighton and Hove. Be committed to increasing the health and wellbeing of people with dementia and their carers in Brighton and Hove by looking at local physical activity programmes, for example dementia friendly gardening. More information on the Brighton and Hove Dementia Action Alliance can be found here.